I am currently working in Shanghai, China. I’ve been studying Chinese since I was a freshman in high school and continued it through my college career. This is my sixth time living in China and my third time living in Shanghai. About the author: Margaret Radl is teaching English to kids and teens with EF English First in China. She lives in Shanghai and teaches online ESL classes. I have been living in Shanghai, China for 4 months and working for EF Kids and Teen’s online platform. I’ve had a decent handful of different jobs back in the States but teaching in China is extremely different than teaching back at home. The nice thing about working for English First helps because since it is a western company you still get a somewhat similar experience as back home. Working for another Chinese companies before, I’ve found that there is often a more “go with the flow” mindset. You have to be flexible and having this trait will take you very far in this company, as well as China. The greatest lesson I learned teaching English abroad is to have an open mind. come with an open mind! China is a beautiful country and EF is a great company to work for! Don’t expect things to be run exactly the same as they would be back home. 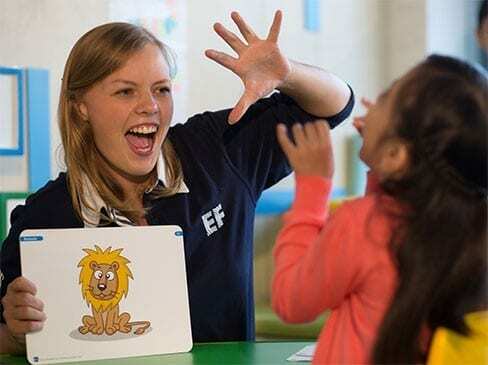 EF is a big company composed of many parts and each one has its own way of teaching. To anyone who is considering applying for a job with EF, I would recommend that you are flexible and prepared to try new work styles. Learn more about teaching in China with EF English First. Find information on job requirements and benefits. I took an online TESOL before coming to work for EF in China. The TESOL course gives you a great starting framework on how to get ready for being a teacher. OnTESOL offers TESOL course packages with young learners specialization. The 140-hour course by OnTESOL will prepare you to prepare full lesson plans using the Communicative Approach and Task-based Learning. After completing the course, you will have the skills to adapt to any textbook using communicative activities, class projects, and authentic materials. Save $200 with the 140-hour TESOL Package with TEYL specialization!